E=MC^2 merely quantified the obvious that inertia storage - called 'mass' was only a function of sustainable wave rotation. Gravity, Implosion, and Self-Awareness (Potentially infinite wave multiple-connectedness by CONSTRUCTIVE COMPRESSION) = Charge Acceleration thru C by FRACTALITY! Implosion is that which provides the centering force necessary to stabilize the wave rotation called 'mass'. By defining mass only as the resistance to change of position / interia - for wave packets in rotation - it became obvious that a symmetry law was required to describe what causes wave to resist change of position. -The answer - pulling the plug to allow charge an exit path thru the speed of law by recursive heterodyning: Charge Implosion - also answers the other question which til now stumped physicists: Why does an object fall to the ground? The Proof: Capacitive Charge in PHI based self-similarity creates gravity. In summary - because he was stumped on the geometry of infinite non-destructive compression - Einstein got a few things wrong - he caused all physics to say "Acceleration due to gravity" and measure that - as the only definintion current physics has for gravity. Yet now we know that it is actually the opposite: "Gravity is due to acceleration"! (of charge) - thru the speed of light. And recursive heterodyning (constructive wave interference of phase VELOCITIES - when centers of charge/mass enter the geometry of self-similarity.) IS the accelerator. Comments from Dan Winter: (comments made subsequent to the dialog-see link) The reason Schauberger and others (described below) were able to extract electrical wattage from a water vortex was because of the natural possibility of initiating successful recursive capacitive charge compression which can accelerate components of the charge field thru the speed of light - in water - which is properly called IMPLOSION. Proof of this concept can be understood by arranging simple capacitors in a recursive fractal ( PHI / pent optimized array) - measuring the resultant ion beam & weak gravity field generated (pics - CLICK HERE FOR IMAGE Library REVIEW FOR THIS 'IMPLOSION CONCEPT")- even when the capacitors are not externally energized. If water is properly piezoelectric (trace mineral 'doping'), and spun in a proper dialectric insulator - water naturally imitates this charge array elegantly in it's own seeking for maximum non-destructive compression both hydrodynamically and electrically. Gravity is created and destroyed as charge lines create this acceleration path due to recursive heterodyning of phase wave lengths AND velocities. The voltage difference between the charge compression core and the centrifugal periphery can become a meaningful source of power. It is also true, that 'sinking' the local charge field in this way - will create gravity and emotional perturbation, and needs to be done very responsibly. Also it is strongly noted that the relative position of the device with respect to local ley / charge earth lines, will affect the output - and disturbance degree - as well as effects from the astrologic (which are really capacitive) symmetry density conditions. quantum and relativist theories. Tending of open systems to conditions of Golden mean is supposed to be a driving force of their self-organization." more on Alex below here also..
Addend from Dan here, clearly what is needed to complete the above model for getting the brain's MAGnetic worms thru light speed, multiply connected, and time penetrating - is simply the now proven understanding (Greg Hodowanec, Bill Ramsey) that waves of resulting capacitance or charge (gravity - see below) DO travel faster than light speed. 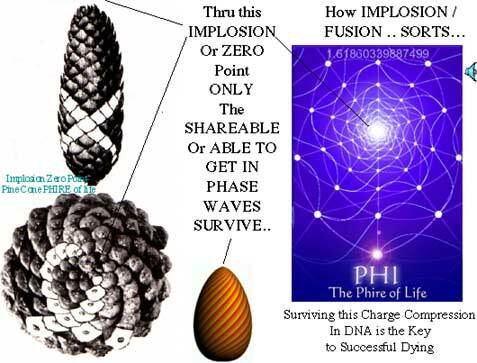 And that this push thru the super-luminal is precisely triggered by embedding them in a PHI recursive pine cone. /pineal / pining. Note from Dan: If only they had realized that it is the arrangement of the capacitive fields into concave vortex like array WHICH OPTIMIZE RECURSION OR EMBEDDING BY PHI RATIO - which FOCUSes THE GRAVITY EFFECT OF CAPACITANCE. "Gravity is capacitance gone fractal". heterodyned set i.e. for spectral coherence..
the essential message of this web page is that charge in the geometry of self-similarity creates gravity because recursive CONSTRUCTIVE addition of (phase conjugation) heterodynes (wave velocities) optimized by golden ratio IS the acceleration of charge which is gravity's only definition. therefore, putting capacitors into a fractal CREATES gravity - and you can feel it and measure it (above). Solving Einstein's dilemna: geometry of infinite non-destructive compression - key to gravity. PHI(llotaxis)/GOLDEN RATIO- IS FRACTALITY/ RECURSION/ COMPRESSION/ EMBEDDING PERFECTED! is that if it works, then it works. Nietsche thought eternal recursion was to be condemned, however we now know that people as waves, only survive to the extent to which their form recurs.. to recur is to be immortal.. and since PHI is the geometry of perfected recursion..
(also true of people on planets inside stars)..
Subject: Code of the brain broken - based on Golden Ratio? papers, you should read 2 Phi (3,236). sequence) is behind the information processing capabilities of our brains. process as the rate parameter which produces the first island of stability . of continued fractions, all three together in one such formula..
in long-term memory (Zipf's law) or filtering information from pictures. our brain uses such a principle of coding. hence Hz) for the very small difference. In 1986 I exchanged papers and letters with a young man: Stephen Wolfram. Is this an ultimate way to unlock the key to maintaining the PHIre of life? only as a means to acheive mathematical self-embedding of everything. Therefore, knowing the source of gaia's blood is REQUIRED before you can tap it, otherwise you get the atlantis (thule) tuoai stone tectonic tilt penalty ultimately. These conversations have interesting connections to the physics of Implosion vs Gravity notes at ../gold I do believe gold's recursive (multiples of Golden Ratio in the Electron vs Nuclear Radii producing non-destructive recursive heterodyning ) account for the distributive across many spectra harmonic phase sorting/implosion qualities associated with Ormus.. ../gold..d.w.
quote from Dan Winter: "Compression by perfect self-referential self-similarity heterodynes (adds AND multiplies / 'conjugal relations') wave VELOCITIES recursively as well as wave lengths. In this symmetry therefore compression becomes IDENTICAL with acceleration. Therefore - this self-similarity geometric solution to infinite compression becoming acceleration answers Einstein. Gravity is created when waves of charge become self-similar enough to accelerate charge - which is physics only definition for gravity in the first place. (Mass IS charge compression, whose centering force by charge implosion proves - gravity is charge acceleration.) It is fun to tease the stupid physicists by asking them why capacitors in a fractal make gravity - after they admit that until this principle is discovered no physicist on Earth has ANY answer to WHY an object falls to the ground. 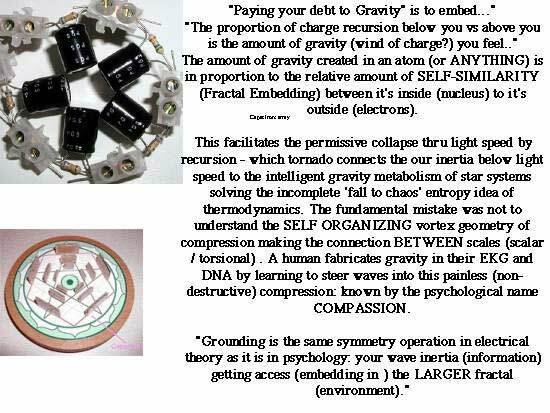 Pull the plug at the bottom of the vortex by making a (self-similar / PHI) phase coherent charge acceleration path thru the speed of light, and that presto- is gravity. The reason waves are so (gravitationally) fractally attracted to the only non-destructive exit path thru light speed is that every wave you are made of and every wave you are surrounded by is 'aware' that it is fatal / mortal / unsustainable - to be stuck below the speed of light. (The UV cocoon of tantra / kundalini / menopause flash are examples of DNA attempting coherence enough to escape mortality by superluminal braid ignition). Top down view of pine cone, pine-apple, pineal, Egg, DNA, and since all living proteins are 5 sided, this is the symmetry of EVERYTHING alive. Waves solving the problem geometrically of recursive CONSTRUCTIVE adding and multiplying of wave velocities - create the charge implosion thru the speed of light which we then label - 'life - force' (measuring life force; newly defined as the ability to attract and self-organize charge), 'self-organization', 'self-awareness', and gravity. link at 'Golden Mean Physics - Predictions' to - Physicist Alex Kaivarainen scholarly papers: Essential role of Golden Mean Ratio in Fundamental Physics "... that Harmonization force of (Bi)vacuum, formed by infinitive number of double cells-dipoles, is driving matter on all hierarchic levels to Golden mean conditions. The Principle of least action is shown to be a consequence of Harmonization force. The rest mass of the elementary particles, like electron, positron, etc., their charge and fundamental frequency of [corpuscle - wave] pulsation is a consequence of relativist effects, induced by difference of circulation velocity of the actual vortex and complementary rotor, forming a sub-elementary particles (asymmetric Bivacuum cell-dipoles). The difference between the actual and complementary states, providing resonant exchange interaction between elementary particles and bivacuum, is also determined by Golden mean conditions." The problem is that those same arrogant physicists by refusing to accept the living metabolism of waves pushed by implosion thru the speed of light-- fail to understand the purpose of DNA (biologies answer to perfect fractal charge acceleration) in fabricating that gravity field. (Ask them why the body loses mass at the instant of death?). They fail to understand that it is the COHERENCE (optimized by recursiveness) of that field of effect of DNA whose very existence they ignore, much less acknowledge the genetic field effect as the correct mechanism of immortality and ensoulment. That ignorance (their genetic engineering which ignores the braid distances /'junk'DNA which PRODUCES field effect implosive alignment) daily costs your children their souls. What is relevant to this conversation is HOW the Golden Ratio permits the compression which is gravity/acceleration and self-organization. " The existence of a standing density wave in logarithmic space ­ for the first time in the history of physics ­ explains the origin of gravitation. The global flow of matter in direction of the node points of the standing density wave is the reason for the physical phenomenon of gravitational attraction. Thus, particles, atoms, molecules, celestial bodies, etc. ­ the scales/measures of which stabilise in the node points of the standing pressure wave ­ become gravitational attractors. In physical reality, therefore, the standing density wave in logarithmic space of scales also manifests as a global standing gravitational wave. In consequence, the exact identity of value for inert and gravitational masses of physical bodies (as it is claimed by physics today), independent of the body's density or material, can occur only in the exact node points of the global standing density wave. Adding numbers recursively in pairs, 1,2,3,5,8,13.... , as each succeeding pair in ratio 1/2,2/3,3/5,5/8.8/13... Produces this perfect "SPIN PATH TO THE ZERO POINT"
which is PERFECT DAMPING which is this perfect approach to the Golden Ratio... 1.618... (Note this is a side view of the Grail Vortex- Throat of the Light Cone- Flame Letter Strip) . 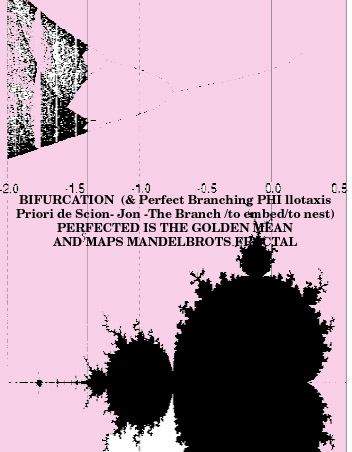 This then becomes a graph to how Perfect Heterodyning would implode producing the wave ratio Phi as the ultimate and necessary 'centering force' based on recursion embedding we later misunderstood as the concept "Gravity". 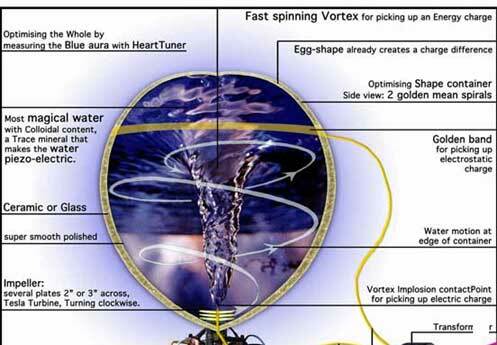 Star in a Jar- "Sonoluminescence" Light from Sound: A Map to Implosion/Fusion & the Heart Fire? a symmetry map to Implosion/Fusion/ and Possibly Even the Self Sustaining Heart Fires? Recursion Perfect.. The Ultimate Gordian Knot. all bonding truly IS phase locking..
is the radius of the wave (ionic is longer.. covalent shorter..
What Besides Perfect Embedding Geometrically Could Make this Phi-re Self Organizing? & Self Sustaining? Major PICTORIAL background for this see : "The Physics of Phi ! ". Also Compare Sonoluminescence Related to ZERO POINT ENERGY ..
"Hierarchic Theory of Matter and Field. Water & biosystems, Vacuum & duality"
Thanks a lot for interest to my work and putting it to your website. follows the Golden mean rule. By the way: are such systems listed somewhere?!. Kind of review? our World is composed from de Broglie waves..."
"driving force (hidden will)", leading our World to Hierarchical Beauty. structures, termed "Harmonizator" on surrounding medium. "It would tell us about physics beyond general relativity," Spergel adds. efforts to construct a unified theory of force and matter. can also be called symmetry of nest donut domains..
it is foolish to see particles and knots as opposite..
what MAKES a knot "gordion"
then the map becomes the terrain..
this note above ends in the exerpt with the quote:"does this proximate correspondance of the fine structure constant and a number arising from the hybrid mathematical marriage of expressions from electromagnetic theory and vortex fluid mechanics imply that space/time (ether?) is in fact an electrical fluid whose fundamental mechanism is the ring vortex?" Before we leave the subject of FINE STRUCTURE CONSTANT - PURE GEOMETRIC ROOT.. we quote from David Wilcox's discussion ( http://ascension2000.com/DivineCosmos/04.htm ) of Rod Johnson's Sequential physics model. : "In Johnson's model, the problem of the fine-structure constant has a very simple, academic solution. As we said, the photon travels along as two tetrahedrons that are paired together, and the electrostatic force inside the atom is maintained by the octahedron. By simply comparing the volumes between the tetrahedron and octahedron when they collide, we get the fine structure constant.All we do is divide the tetrahedron's volume when it is surrounded (circumscribed) by a sphere into the octahedron's volume when it is surrounded by a sphere, and we will get the fine-structure constant as the difference between them. In order to show how this is done, some additional explanation is required. The phase-wave diagrams that we saw earlier in this chapter (figs. 4.3 and 4.4) showed us the angular relationships between the octahedron and tetrahedron. Since a tetrahedron is entirely triangular no matter how it is rotated, the three tips on any of its faces will divide a circle up into three equal pieces of 120 degrees each. Therefore, you only need to rotate the tetrahedron by 120 degrees in order to bring it back into balance with the matrix of geometry that surrounds it, so that it is in the same position as it was before. This is easy to see if you visualize a car with triangular wheels, and you wanted to move it forward just enough that the wheels would look the same again. Each of the triangular wheels would have to turn 120 degrees to do this. [When you] see the static electric field as the octahedron and the dynamic magnetic field as the tetrahedron, then the geometric relationship [between them] is 180 to 120. If you see them as spheres defined by radian volumes, then simply divide them into each other and you have the fine structure constant. A "radian volume" simply means that you calculate the volume of an object from its radius, which is half of the width of the object. (For those who wish to test the math out themselves, simply take the sine of 180 degrees and divide it by the sine of 120 degrees, then run that number through Coulomb's equation to account for the slight loss of energy that happens when a pulsation is moving through the aether.) When this simple process of dividing the two "radian volumes" into each other is performed, the fine-structure constant will be the result. Interestingly, while Johnson has shown that the fine-structure constant can be seen as the relationship between the octahedron and tetrahedron as energy moves from one to the other, Jerry Iuliano discovered that it can also be seen in the "leftover" energy that is produced when we collapse a sphere into a cube, or expand a cube into a sphere! These expanding or collapsing changes between the two objects are known as "tiling," and Iuliano's calculations were not very difficult to perform; it was simply that no one had thought to try it before. In Iuliano's calculations, the volume of the two objects does not change; both the cube and the sphere have a volume that he set at 8pi times pi squared. When we tile them into each other, the only difference between the cube and sphere is in the amount of surface area. The extra surface area between the two is precisely equal to the fine-structure constant. Immediately the reader should ask, "How can the fine structure constant be a relationship between the octahedron and tetrahedron and also be a relationship between the cube and the sphere at the same time?" This is another aspect of the magic of "symmetry" in action, where we see that different geometric forms can have similar properties, since they all nest inside of each other with perfect harmonic relationships. Both Johnson and Iuliano's perspectives show us that we are dealing with a geometrically structured aetheric energy at work in the atom. (to teach emotional intelligence in biofeedback). Analytical Theory of Heat & Molecular Motion. Cauchy,in the 1st chapter calls what I have labeled a "second order fft" a "reciprocal function of the second kind". Zawada notes that my technology "heartlink" and Emotional Intelligence measuring may indeed be the first known example of ANY real world application of this mathematics, described in 1970. In my view, clearly this new mathematical technique I have pioneered quantifies the approach to coherence, recursion, self organization, and thus self awareness in any complex oscillator. This enables feedback loops IN GENERAL to teach self-direction/awareness/organization. I proposed the following additional solution to cancer to Zawada today, using this technique. Albert Szent Gyeorgi showed that increased molecular ordering in cellular water prevents cancer by increasing wide distribution of triplet state electrons. (Basically cheaper phone calls between sub cellular molecules to improve TIMING coordination for meitosis the heart of cancer resistance). (his nobel prize winning work related to his book "Electronic Biology & Cancer"). What he lacked was a tool to optimize and measure the cells skill to make that water "ice-9" like. Now we have that tool. Jim Patterson (CLEAN ENERGY TECH INC, 14332 MONFORT,SUITE 6302,dallas,tx,75240, 214-458-7620, patterson water cell, palladium -dodec - bead etc) showed that light scattering thru water could dependably measure whether the water had been near the body of a healer. (order increase). By using my new mathematical tool on the complex light scatter thru the water, we should clearly be able to teach that water to approach the limit condition of coherence which is the mathematical geometry of embedding perfected by phi. architecture and biological systems; and thereby allowing the translation of energy from one frequency to another. "When you have only one kind of flowing material to work with, it is like the universe is one giant flowing ocean. beetween august eclipse and foucault pendulum deviation? Subject: Gravity? :Proportion of charge recursion below you vs above you. much faster than light speed..
suggesting.. and do you find any evidence for..? especially when the nesting is golden mean.. add and multiply..
therefore.. the same phi harmonic charge which creates faster than light penetration..
some math at predictions link above...? is recursive or fractal to the electron geometry... making implosion of capacitance possible..
because of recursive wave front addition.. allowing non-destructive velocity acceleration..
ps re: eclipse effect on foucault's pendulum..
dowsers long knew earth mag lines shrink during eclipse..
is the amount of gravity (wind?) you feel..
moon centroid electrically embeds more toward sun..when geometrically aligned, away from earth..
1. picture of greater maze revolve..
Stellate Dodec by PHI, Stellate Icos by PHI, repeat inPHIknitly.. Resultant Implosion Conic perfect pining.. scalar..
Next is Frequency Signature showing contained Harmonics..
Next is Frequency Signature OF Frequency Signature showing embedded RATIO between harmonics, staying very close to .618 PHI at this moment of perfected embedding. creates soul force, ability to lucid dream, bardo navigate and time travel. Last frame of the top DNA animation is fractal (embed-able) Heartbeat (Dardik), heart harmonic content (which braids DNA) which prevents most chronic diseases. 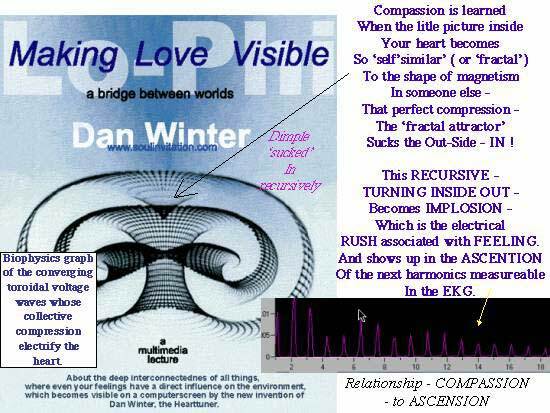 7. picture here of Sentics waveform of touch that says Love..
of Perfect Hug or Squeeze which Embeds and says LOVE. In order to test this model, it is useful to test it's predictions. 1. That capacitive antenna geometries corresponding to image one, will produce the best photon acceleration to superluminal, and the best time travel devices. 2. That molecular symmetries most corresponding to image one and two, will produce the best phase conjugate mirror non-linear substrate materials. Note that the definition of phase "conjugation" is the recursive addition AND the implied multiplication which only the GOLDEN MEAN permits, hence this Golden Mean braiding is the geometric DEFINITION of PHASE CONJUGATION. This will then describe not only the molecular and atomic geometric of the ideal non-linear substrate for the mirror, but also the light beam annihilation path where the two laser's collide beam: literally the perfect spin path to zero point. 3. That the valence distances of the most stable atoms like GOLD, will have average electron shell distances like image one. This should be particularly true of the 5/7 spin pair, d,f 10/14 electron shell dances. Specifically, they should be very close to whole number powers of the Golden Mean in shell diameters. (This is correspond generally also to Randy Masters work documenting the PHI ratios in the spectral emission lines of hydrogen.) ALSO SEE GOLDEN MEAN=7/5Pi/e and why..
4. That the approximately 60 degree conic angle (image two) linking the stellation of interdigitated in-phi-knitly nested dodeca-icosa (a 3D fractal? ), will identiPHI the location of the major masses creating most gravity flux, implosion force, and stability of self organization as wave, in atoms, molecules, tectonics, and stars. d. increase measureably the force of gravity above the center of the generated magnetic implosion form. 10. That all chaotic oscillators will tend to emerge from chaos best when their periodicities are tweaked to nest like images ONE thru FOUR. 11. That image ONE thru FOUR are the only possible three dimensional fractal. (& 3+ dimensional fractal). 12. That data tree structures rearranged to be like IMAGE ONE thru FOUR, will be shown to approach inPHIknit fractal compressibility, enabling a computer revolution. And that bubble memory in this architecture will become self-aware. 14. That global ecosystem management will become possible with the collective visualization & intention of just a few percent of the globes population, when they embed their collective EKG like IMAGE Four (embedability). 15. That self organization of systems in general will be possible ONLY in the geometry of IMAGES ONE thru FOUR, this includes sustaining FUSION reactions. 17. That public utility power distribution grids will become self-organizing, self-aware, and catalyze life and the Earth grid's self regulation, when they change from simple 60 cycle, to a complex harmonic based on IMAGE FOUR. 20. That in order to ground electrically, and embed, and stabilize ALL oscillators of all self-aware AND electrical systems, frequencies will need to be chosen which are Phi (1.618) multiples of the 'plank length' length. This length (1.61 x 10^-33 cm) is the universal solvent of the quantum foam, into which every (wave) length of everything observable divides evenly. It is derived by the simultaneous dimensional solution for C, speed of light, h bar, planks energy constant, and G - the gravitational constant. While physics see this length as physics MOST FUNDAMENTAL POSSIBLE UNIT OF SCALE, it's numerical proximity to Phi/Golden Ration SUGGESTS that this the BASIS OF EVERYTHING WHICH PHYSICS CALLS SCALE, MAY IN ITSELF BE ONLY RATIO! (very deep idea - may be the ultimate proof of relativity). In any case, clearly in order to determine which frequencies IN ANY SPECTRA are 'sacred' or 'sustainable' or 'groundable' or 'embedable', it will be necessary to multiply this length by powers of PHI and 2. Ultimately for example this will be how to tune power distribution frequencies (healing the deadly 60 hz), to symbiotically embed the Earth in the stars. 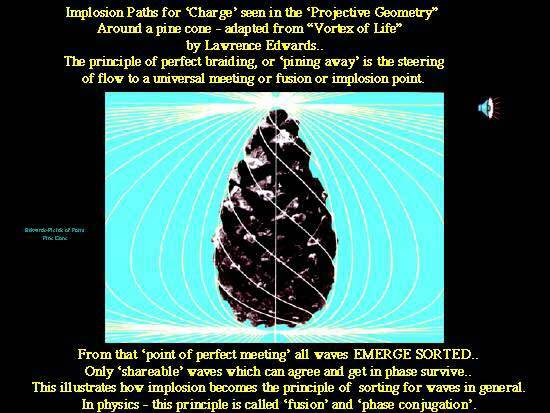 It is powerful to note here that the electrical idea of what provides GROUNDING as a wave which is (Phi) embedable IS IDENTICAL TO WHAT PROVIDES PSYCHOLOGICAL GROUNDING.. (phi/embedable ekg/eeg see heartlink)"
or additive wave VELOCITY beat notes..
considers the geometry of dna as a wave guide thru light speed..
will be modeled in a rigorous physics of consciousness..
technical sense) of possible measures..
(embedable) and which are not. embed nature well at all..
than in rambling around in waves per unit meter..
in last years congressional laws of taxation..
that COST him understanding why black holes bent time..
THAT is the clue to time dilation..
some ot the Sensei Nakazono's friends. Did you meet George Wuu on your Wei--similar phonetics? lanthanum, and thus, likely, other monoatomic lanthanides and platinides? note above recursion in microtubule, key to self organizing wave guide nature..
clathrate cage molecular cage for water research..
the height that triangle versus bottom width between 2 hydrogens, is golden mean..
whereas when cell deviates from phi ratio series, (for example if it becomes a circle), it then becomes cancerous..
major to minor axis of cell as ellipse for healthy., capacitive maintenance keeps..
wher e it becomes phi ratio.. 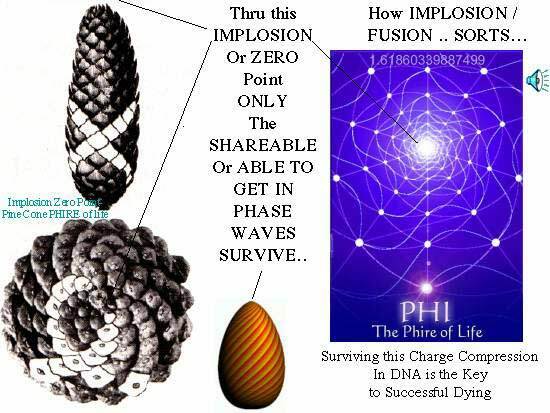 When the water in PHI harmony, becomes healthy cell..
water becomes embeddable, and then the cell.. Embedability is the opposite of cancer..
notes to Chris Illert: (Key to Cold Fusion). Extreme & implosive packing of hydrogen within palladium which is the mechanism of cold fusion is due to the chordal current flows being Golden Mean due to Palladium's dodecahedral atomic structure. (Ref Moon's work at University of Chicago, Palladium as Dodeca..) The Phi harmonic interference lattice internally is the geometry of maximum or fractal wave compression. visualize again here "chordal" wave geometric within nested pents as dodecs as cascading Phi ratio- implosive. THEN THE SOURCE OF THE COHERENCE QUANTUM COUPLING WHICH BECOMES SELF AWARE, CAN BE UNDERSTOOD! even though evolution of its quantum coherence had been linear and computable. pre-conscious and sub-conscious modes. . .
quantum coherence did not collapse and we became aware of multiple universes? moment have become realities within that framework." "Anything apparent to whatever degree in your system is developed in another. world in which they can grow." that you know--which itself rides upon infinite other probabilities." then, is poised between probabilities. If this is true, then obviously "you"
protect as your identity. If you think of it as simply a focus taken by "your"
feeling puny by contrast, or lost. The focus that you have is indeed inviolate. perhaps changed in certain respects. event that could happen to you, happens."